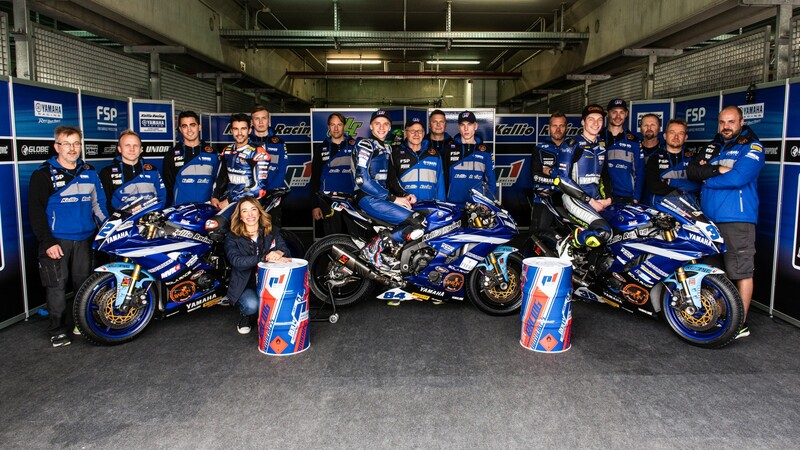 Ahead of the MOTUL Dutch Round, WorldSSP team Kallio Racing have announced a new technical partnership with P1 Racing Fuels, an Irish company well-known across Europe and Asia as a full-service provider of high-quality fuels. Counting on the experience of the Finnish based squad, that last year brought German rider Sandro Cortese to success as he was crowned 2018 FIM Supersport World Champion in his debut season in the class, P1 Racing Fuels aim to continue develop their products in the most competitive and exciting support class of WorldSBK thanks to their collaboration with Kallio Racing. Kallio Racing and P1 Racing Fuel have already been cooperating since a year, and by extending their the partnership to the WorldSSP squad, the fuel producer was able to create a specific and FIM certified product designed for the production-based motorcycle championship. The partnership between Kallio Racing and P1 Racing Fuels was launched at the Motocard Aragón Round last week, a race weekend that saw their rider Thomas Gradinger making a significant step forward in the class, as he took the first Superpole in his career on Saturday and he was closed to finishing on the podium in Sunday’s race. After an intense battle at the front, the Austrian rider crossed the line in fourth position, which also correspond to his best result in WorldSSP so far. Onboard the other two Yamaha YZF-R6 of Kallio Racing there are Spanish rider Isaac Viñales and Frenchman Loris Cresson, who are currently tenth and twelfth respectively in the general standings. Vesa Kallio, team principal of Kallio Racing, added: “We are extremely excited to begin this partnership with P1 Racing Fuels. We have planned our ideal cooperation for about a year as it is important for both of us to find products and ideas that satisfy both parties. P1 Racing Fuels have an old tradition in four-wheeled motorsports, and now with us, they are making their first step in the motorcycle environment. We have had great results with their fuel, and we look forward to continuing working together”. Follow Kallio Racing and P1 Racing Fuels at the Motul Dutch Round thanks to the WorldSBK VideoPass.